The evolutionary UltraCare® XT is one bed with the ability to adapt to many resident care environments. Through a remarkable combination of performance, function, and style, the UltraCare can be easily transformed to fit any configuration or room style. Upgrade to suit your facility's needs. Choose options such as SafeLight, UltraLock, and UltraWide or experience other great features to customize your UltraCare bed. 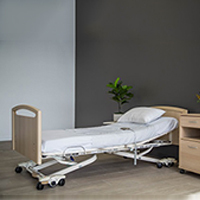 The Ultracare XLT beds are guaranteed for a period of five years from the date of delivery. Steel structural components on beds are covered under warranty for a period of 15 years from the date of delivery.